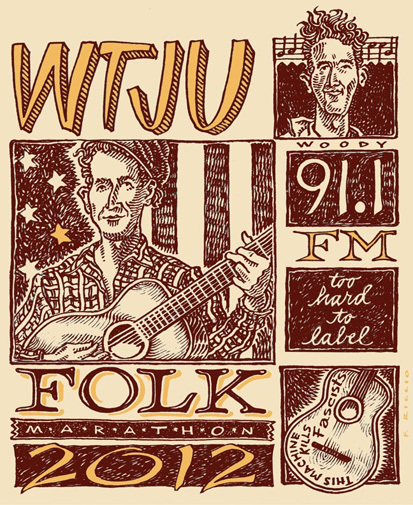 The 2012 Folk Marathon is upon us, and what a schedule we have lined up for you! Our theme this year is “Too Hard To Label”. While that is certainly true for the breadth of programming heard on WTJU, we will be focusing on five of our favorite music labels: Smithsonian Folkways, Signature Sounds, Compass, Rounder and Rebel. And in honor of Woody Guthrie’s 100th birthday, we will do a few shows in his honor. Well known illustrator Frank Riccio has also contributed this year’s t-shirt design, and we believe it may well be one of the best ever. Not only have our regular announcers come up with the usual line up of special programs, but several musicians from the community are doing programs; and we don’t mean just live performances. Yes we have Love Canon, Virginia Ramblers, Buzzard Hollow Boys, Trees on Fire, Downbeat Project and Alligator coming in to play during the fundraiser. But other musical acts are also going to program their own shows during the marathon. Charlie Pastorfield, Beleza, the Honey Dewdrops, Chris Pandolfi and Andy Falco from the Infamous Stringdusters, Alex Caton and Ned Oldham, Morwenna Lasko & Jay Pun, Jeff Vogelgesang and Grant Colby, and Joe Overton will all host their own shows for this year’s folk fundraiser. We also have one WTJU alum, Aaron Margosis, aka The Eclectic Baboon, coming back to do an all Lucinda Williams show; a longtime listener (and UVa alum) in Pennsylvania, Michael Mabry, driving down for a show he is calling Creeque Alley, and a well known Louisiana expat now living in this area, Dave Shreve, serving up a program filled with the sounds of Cajun and Zydeco. During the overnight hours from midnight to 6 am, we will be airing several of Jorma Kaukonen’s (Hot Tuna) Fur Peace Ranch radio program, which include interviews and live music with musicians such as Tony Rice, Peter Rowan, Larry Keel, Chris Smither and John Hammond. That’s only scratching the surface of what is coming up April 30 through May 6, so be sure to check out the complete schedule. In order for us to reach our goal of $40,000, we of course need to hear from you. So please take a moment to make your donation by calling 434-924-3959. Or you can also contribute on-line via our secure server. The special Vagabond Shoes marathon show starts this Saturday at 6pm and runs a little later until 8pm. During the Folk Marathon 2012, it’s all about numbers – the number of pledges, the dollar amount pledged, the number of listeners who support us – but also about a number of musical styles, from traditional folk to country and its “alt” descendants to folk-rock to Celtic and world. We’re also going by the numbers in song titles, from “One to Many Mornings” to “Fifty Ways to Leave Your Lover” to “(I’d) Wait a Million Years.” See how it all adds up on Saturday at 6 when we hope to add your number to the pledges of support for WTJU! Also, David has a show this Wednesday, May 2, from 2-4 pm. Founded in 1888, Columbia Records is the oldest brand name in recorded music. In 1948, Columbia introduced the LP format that could contain an entire symphony, musical, or thematic album of vocal or instrumental music — a standard still in use today for the growing minority that still enjoys vinyl. 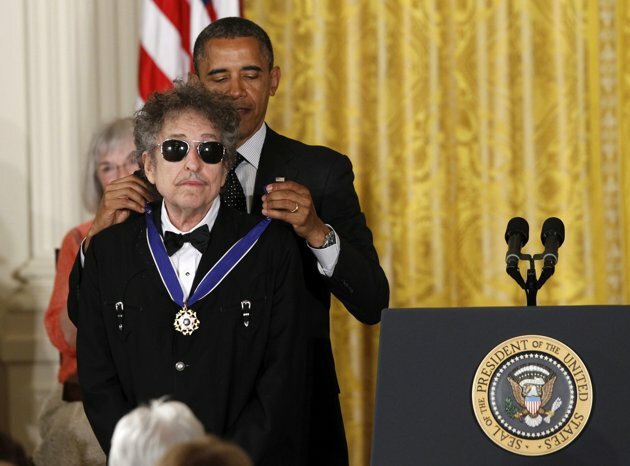 Columbia was one of the pre-eminent record labels for folk and folk-rock movements in the 1960s and the singer/songwriter ethos that emerged from that, discovering Bob Dylan, the Byrds, Moby Grape, and Simon and Garfunkel, as well as others you may have heard and some you may have forgotten. We’ll delve into that rich vein of folk musical history by putting the needle in the groove. Don’t let the occasional scratch or pop deter you; we can only continue to maintain our commitment to such a high quality musical experience with your generous pledge of support to WTJU during the 2012 Folk Marathon. We’re looking for a record show of support that only you can help bring about. Thanks for your support, without which none of this would be possible.